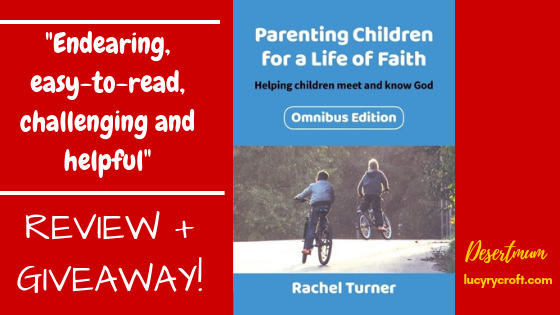 Parenting Children for a Life of Faith – review and GIVEAWAY! Earlier this week, I wrote a message to Christian parents whose adult children don’t follow Jesus anymore. I was responding to what some of my readers have shared with me, as well as trying to think ahead and put myself in their shoes in 20 years’ time, attempting to understand what I might be feeling, and how I might want to be encouraged. I mentioned the trickiness of writing a blog about Christian parenting, encouraging each other to do all we can to nurture our children’s relationship with God, yet also knowing that these children will one day grow up and need to make their own decision. I don’t want you to be discouraged though, as you teach, encourage and equip your children to connect with God for themselves! Sure, there are absolutely no guarantees when it comes to discipling our children – but the Bible makes it clear that we ARE called to do it. The rest is up to them and God. I have been reading an excellent book along these lines which I’m delighted to share with you today. Parenting Children for a Life of Faith (Rachel Turner) has been around for a few years, along with its sequels Parenting Children for a Life of Purpose and Parenting Children for a Life of Confidence. But in October, BRF brought out Parenting Children for a Life of Faith (Omnibus Edition) which comprises all three books, and it is this book which I’ve had the pleasure to read and now share with you. It’s a pretty hefty tome, containing three books, but there’s no need to be daunted. All the chapters are short and extremely readable. Rachel Turner has a very accessible style, with plenty of stories and examples to bring her points to life. It’s also very possible to dip into different chapters (as I’ve been doing for this review). I would recommend reading it from start to finish (as I intend to in more depth, over the coming months), because Rachel introduces frameworks and patterns which she then refers to in subsequent chapters – but you can find plenty to inspire you if you only have time to dip into a chapter now and then. What struck me about this book was just how much I need it. After nine years of parenting, I feel I am only just scratching the surface in terms of understanding how my kids respond to events, and how I respond to them, and how that may or may not be affecting them. In fact, I’d go as far as to say that just when I think I’ve got parenting all wrapped up, at least one of my kids moves into a new ‘phase’, and the whole thing needs rethinking again. I’ll be honest and say that, just right now, I’m feeling pretty negative about my ability to nurture the four precious souls God has given me. So I need this book. And maybe you do too. As intentional as I am about my parenting, this book opened my mind to so much that I’d never even considered. For example, I’d never thought before about the wrong views of God that my children might have picked up, and how to re-allign them. I’d kind of assumed, rather arrogantly, that we were teaching them all the Right Stuff. But we’re sinful – they hear our words, and they see our actions, and these don’t always match up. And then there’s all the stuff they’re hearing from school and church and the media. All in all, that can make for a pretty confusing idea of who God is. Another idea that I picked up, and started to put into practice immediately, is encouraging our kids to ‘chat’ to God, rather than follow the rather formulaic (and, if you think about it, non-relational) ‘thank you – please – sorry’ model. As Rachel points out, these are all essential words to use too. Any strong marriage features them in its communication: but if that was all I said to my husband, we wouldn’t have a very close relationship at all! Likewise, our relationship with God can be more ‘chatty’, and maybe this starts more of a genuine and personal connection. These ideas came from the first of the trilogy of books contained in this omnibus. But the second book, Parenting Children for a Life of Purpose, offers great brain fodder too – specifically on the idea of nurturing our children into using the gifts God has given them – both practical and spiritual, so that they are aware from an early age of their place in the world. The third book, Parenting Children for a Life of Confidence, might sound a little ‘self-help’ in theme, but the very first chapter reveals that it’s anything but. Contrary to the world’s idea that we should be confident because we are awesomely wonderful – or the incorrect ‘Christian’ theology that we should be confident because God made us and we’re awesomely wonderful – Rachel outlines that we should be confident because we trust in God – in other words, our confidence is in Him. The rest of the book goes into more detail, and no tricky area is avoided: peer pressure, bullying, body image, competition. All the areas which might shake a child’s confidence, Rachel calls out with truth and boldness, giving us helpful and practical ideas on how to handle these situations with grace and Biblical promises. One thing I particularly appreciated about all three titles was the helpful way Rachel reduces concepts to simple frameworks which are easy to remember. That’s not all there is – Rachel expands on these throughout each book – but for a tired and busy parent, it’s good to have short, memorable phrases to pull out when we need them. At the end of the book there’s an extensive collection of FAQs, including how to disciple a child if your partner is not a believer, how to nurture the faith of a child who doesn’t like to read, and how to encourage children to exercise spiritual gifts. No stone has been left unturned. So, just to recap, this is THREE BOOKS IN ONE. Don’t be put off by the size: it can easily be read one book at a time, or even one or two chapters at a time. Rachel Turner’s style is endearing, easy-to-read, challenging and helpful. She is a parent and children’s worker of many years experience, so she sees the full picture of kids and their developing faith. Parenting Children for a Life of Faith would make a fabulous Christmas present for a Christian mum or dad. And – even better – BRF has kindly given me a copy to give away on this blog! To enter, simply sign up for my emails here (and you’ll also get my free e-book “15 Spiritual Practices Every Tired Parent Needs To Know”). If you’re already getting my emails, simply comment below for a chance to win. A winner will be picked by a random number generator on Sunday at 8pm (or, let’s be honest here, as soon after 8pm as I remember there’s a giveaway winner to be picked). I’ve previously dipped into the first book in this series and agree that it’s a great trove of simple easy-to-remember frameworks. I’d be keen to read the two further books, especially with F now entering the ‘tween’ years when worldly things break in and confidence and purpose both need a lot of TLC! I’ve just started listening to the Parenting for Faith podcasts, they’re great! This book would be great! Sounds like a really helpful book – I really need to read this! The original Parenting for Faith book was one of only two books I read on maternity leave(s)! Would love the impetus to read Rachel’s other books, too! Sounds really interesting & helpful, definitely one I should read!